Place Turkey and enough brine to cover in a large pot. Refrigerate for 12 to 24 hours. If turkey floats to top weigh down with a plate and cans to keep it submerged in brine. Preheat oven to 400° rub 2 tablespoons mushroom sage extra virgin olive oil over the skin of turkey. Sprinkle pepper over skin and in cavity. Tuck wing tips under loosely truss legs and place turkey on a V-shaped rack in roasting pan. Tent breast with foil. Put turkey in preheated oven. 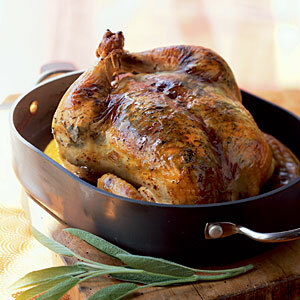 To ensure the bird cooks evenly rotate roasting pan 180° every 30 minutes. Roast for about one hour remove foil and baste Turkey with 1/2 cup of warm stock mixed with one tablespoon mushroom sage extra virgin olive oil. Start checking internal temperature after about one hour by inserting an instant read thermometer in the meatiest part of the thigh not touching the bone. If legs or breast begin to get too brown cover loosely with foil roast until internal thigh temperature reaches 165° total roasting time should be about two to two and three-quarter hours. Let bird rest least 20 to 30 minutes before carving.